My reading of Us Conductors was very much influenced by the confluence of two streams of personal serendipity, so it seems only right that I acknowledge them before discussing the novel itself. Strange as it may seem, stream one originates with the hugely entertaining UK television series, Midsomer Murders. Mrs. KfC and I are fans and have been entertaining ourselves in the last few months by revisiting our DVD collection. Along the way, we paused to watch the show’s tenth anniversary special and I was intrigued when the series music director talked about his decision to use the “theremin” in Midsomer Murders’ distinctive theme. While I enjoy many types of music (and almost always have something playing while I read), I’m no expert — and I’d never heard of the theremin. Some quick Internet research left me intrigued. Stream two has a much stronger literary connection. Since 1996, Random House of Canada has been running its New Face of Fiction program. Every year the publisher features at least one (and often more) debut Canadian novel and they have an enviable record of success in spotting superb new writers. Ann-Marie MacDonald, Yann Martel, Timothy Taylor, Drew Hayden Taylor and Alexi Zentner are just a few of the exceptional authors who first appeared under the New Face of Fiction banner (you can see the full list here — I’ve read many and heartily recommend almost every title). Us Conductors is this year’s only title. I was looking forward to it and (here comes the confluence) became even more intrigued when the book arrived — it’s based on the life story of Lev Termen, the Russian scientist and inventor who in the early decades of the twentieth century gave the world the theremin. Three weeks before I had never even heard of the instrument and here’s a whole novel about its inventor! What’s a theremin? It’s an electronic box, much like the one by your tv set, with two antennas emerging from it — one sticking straight up, the other a loop. The world’s first electronic musical instrument (pre-Moog synthesizer, although Moog markets the modern version), the straight antenna controls pitch, the looped one volume. The musician “plays” the instrument with movements much like an orchestra conductor (the cover of the novel is a fair representation), the right hand controlling pitch, the left volume. The sound is very distinctive but talented players can produce quite recognizable versions of classic pieces (more on this later in the review). I was Leon Termen before I was Dr Theremin and before I was Leon, I was Lev Sergeyvich. 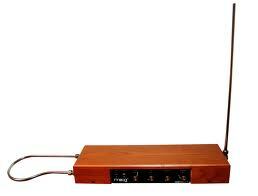 The instrument that is now known as a theremin could as easily have been called a leon, a lyova, a sergeyvich. It could have been called a clara, after its greatest player. Pash liked “termenvox.” He likes its connotations of science and authority. But this name always made me laugh. Termenvox — the voice of Termen. As if this device replicated my own voice. As if the theremin’s trembling soprano were the song of this scientist from Leningrad. I laughed at this notion, and yet in a way I think I also believed it. Not that the theremin emulated my voice, but that with it I gave voice to something. To the invisible. To the ether. I, Lev Sergeyvich Termin, mouthpiece of the universe. I was still a student, scarcely out of adolescence, and I invented a magical box. The radio watchman emits an invisible electro-magnetic field and then waits for a disruption. If a human body passes inside this field, the circuit closes and an alarm goes off. Imagine a vigilant wireless set, keeping guard. The principles of the radio watchman eventually evolve into the idea of the theremin — Lev begins developing it while employed at the Physico-Technical Institute in 1921. He demonstrates his first model to the engineers and physicists there and they are impressed. Indeed, so impressed that he soon demonstrates it to Lenin himself. And the new Russian rulers, eager to show people that their regime equals exciting new science send him on a tour to give concerts around the country. It is not long before global politics takes over. Lev’s discovery (and it is only one of many that spring from his brain) is viewed as a national asset that needs to be exploited. With Pash as his minder (Lev is hopeless at normal things like administration and business), he is sent to America — not as a normal type of “spy” but rather an early version of global corporate espionage. Lev’s inventions get the pair into companies like RCA Victor (which actually contracted to build the first commercial theremins — the Crash of 1929 coincided with their launch and sales were few); once inside the organizations, Pash goes to work on finding information that is of use to the mother country. While things are going well in the initial pre-Crash years, Lev does all this from a posh suite at the Plaza Hotel. When those bills mount up, the wealthy husband of one of his theremin students offers him the use of a four-storey midtown brownstone that becomes rehearsal hall, laboratory and living quarters. It is the jazz age and Lev is living the good life — he meets Clara (who switches from the violin to theremin), falls in love with her despite her being much younger and enjoys considerable early success. Throughout Part One of the novel, I found myself comparing it favorably to Jean Echenoz’s Lightning, an excellent novella based on the American adventures of Nikolai Tesla, another Russian scientific genius (also with no everyday life skills), who a century before Lev Termen had followed the same route. Both books not only make invention and science an interesting story, they offer insightful pictures of the New York of the day. 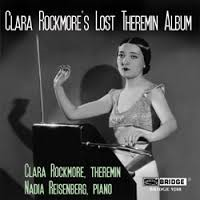 Part One of Us Conductors exceeded all my considerable expectations — I even spent $10 to buy Clara Rockmore’s “Lost Theremin” album from iTunes to play along as I read it. (If you are interested but not up to the investment, a You Tube of her playing Saint-Saens’ The Swan can be found here — she’s accompanied on the piano by her sister, who also features in the novel). Alas, Us Conductors has a Part Two and that locked cabin on the Stary Bolshevik is ample foreboding. Part Two is also a journal directed to Clara — this one written in 1947, eight years after Lev’s return to Russia. Stalin was firmly in control when he arrived, his American experience was viewed as treason not a service to the state and he was soon off to the Gulag. He has “escaped” that fate by the time he is writing the journal — his inventing abilities are now being exploited in Moscow where he is resident in one of the state’s “scientific prisons”. While Part One was an entertaining and illuminating fantasy, despite its basis in real life, Part Two fell flat with me — I have trouble reading fiction about Stalinist prison life when it is written by Russians who experienced it and balk completely at versions produced by Western writers. To Michaels’ credit, he does conclude with a plot twist that restored my interest. Perhaps, in the interests of being honest myself, I should follow Michaels’ approach. My Midsomer Murders and previous New Face of Fiction experience left me inclined to like this novel — and I very much did, until another stream of serendipity (aversion to Gulag fiction) provided a stronger, negative current. Other readers may well not experience the disappointment in the second part of the book that I did. And even with that caveat, I would call this another success for the New Face of Fiction project.